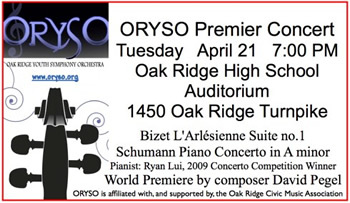 On TuesdayApril 21, 2009 – 7p.m., the newly established Oak Ridge Youth Orchestra will have its premiere performance. The performance, under the direction of music director and conductor Rachel Grubb, will be held in the Oak Ridge High School Auditorium. 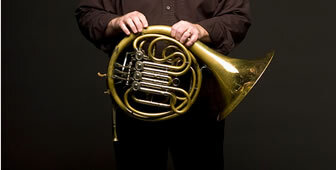 The first performance will include: Bizet’s L’Arlesienne Suite no. 1, Schumann Piano concerto in A minor and a World Premier by composer David Pegel. Cost: Reserved advance tickets :: $10. General admission at the door :: $5, student tickets :: $2. ** The ORYSO is a 50 member organization whos members are drawn from 12 area schools from six East Tennessee counties and is supported in part by the Oak Ridge Civic Music Association.